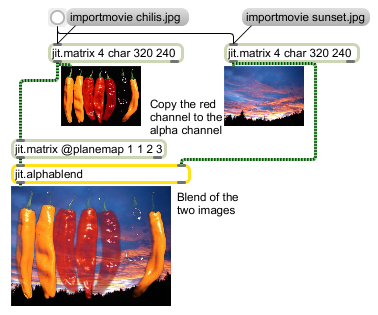 The jit.alphablend object uses alpha channel (plane 0) of the input matrix in the left inlet as a per-cell crossfade value, and crossfades between the input matrices in the left and right inlets. In mode 0, a low value means more of the right input matrix, while a high value means more of the left input matrix. In mode 1, a low value means more of the left input matrix, while a high value means more of the right input matrix.